Hey, long time, no blog. As I have watched the broad market continue to float higher, and as I watch debacles like $AAPL gapping 50 points down back in January, I of course try to make sense of it all. WHY is it happening? For a trader, the answer is “I don’t know, I can’t know, I don’t care”. A trader just goes with what is happening. This has always been a difficult mindset for me. Still, I am always trying to improve my understanding of how the market really works so I can better take advantage of it. Take the $AAPL case. One day the company is worth $500+, according to market prices. The next, it gets slashed by more than 10%. Did the company REALLY change value that much, intrinsically? No. It was the same company yesterday as it is today. Does the new post-dump share price represent a fair valuation of the entire company? Possibly. But what has really happened? A small subset of owners of the company with a small subset of the total outstanding shares decided (or were forced by margin calls) that they needed to sell at this price for any number of reasons. Did every share outstanding get truly revalued in a market transaction? I would say NO. Every share outstanding got marked-to-market based on these few transactions. If you try to think of stock price as a proxy for what people think a company is worth (i.e. market cap) then none of the day in, day out price changes you see in stocks really make any sense at all. In the past this has caused me to stand by in a stupor in the face of strong uptrends without joining in. It just doesn’t make sense from a market cap and company valuation perspective. As I was thinking it through, I realized something. Basically, money is created and destroyed in the stock market each and every day. There is no law of conservation of money, nor is there any such thing as “price work”, meaning trading energy applied to the stock to revalue it. Thinking of the markets in terms of physical processes (like momentum, work, energy, force) is inherently flawed. Let me explain. In physics, things have intrinsic properties. A tank full of jet fuel contains a certain mass. It has internal energy defined as temperature. Each and every particle in the tank has these attributes in basically an equal distribution. If you wanted to heat that tank of fuel from 50F to 200F you would need to apply heat energy to the entire system. You would have to apply enough heat to each individual particle to raise its temperature from 50F to 200F. We then sum up all the heat needed for all the particles and that is the total energy required to heat the whole tank. (This is not necessarily how you would do the math, but physically it’s an accurate description of what happens in reality.) If you wanted to heat half that amount of fuel from 50F to 200F, it would take half the amount of total energy to do it. Now, if you think of stocks in this way, your brain will turn into greek yogurt quicker than you can say “austerity”. Say that we start with a “tank” full of stocks, such as every single share of AAPL outstanding. If the market price is $400, then we determine that all the shares in the tank are “worth” $400 each. The tank as a whole (the entire company) has an ‘energy state’ called market cap. Total number of shares * $400 = the “value” of the entire company. Now you would think that to raise the market cap by 25%, you would need to apply monetary buying pressure to each little share until they are all up by 25%, so that the whole is equal to the sum of its parts, just like in physics. NOPE. So when you see a stock chart, and you wonder “How can everyone think AAPL is worth $700 per share!?! Are they crazy? !” make sure you stop yourself and think again. In reality, a relatively few people think that a small fraction of those shares are worth that $700 right at the moment of the transaction. All the rest of the shares outstanding are marked-to-market based on this tiny sample. That is why company valuations can be so whacked out for so long. The key is to predict how traders may react en masse when this financial alchemy happens. Besides just the revaluation of all of the stock, I think that this effect is also highly magnified by the derivatives market. Increasing the value of a million shares by $1 can result in a huge magnification of hundreds of millions in the options contracts. The tail wags the dog. These thoughts help me to align my market paradigm closer with auction theory and away from physical analogies. The difficulty for me is turning this knowledge into actionable trade ideas. Are You REALLY Accepting the Risk of Your Trades? In listening to the “Trading in the Zone” audiobook, I came to a section about truly thinking in probabilities and what it means to accept the risk of your trades. This got me thinking about a few things. The basic facts are that we cannot know what will happen before we take any individual trade. There are too many unknowns and unknowables to have any certainty. We can have an edge that plays out over time, but in each individual trade literally anything can happen as any other traders enter or exit trades while we are in the market. It’s one thing to know that not every trade is a winner. It’s another thing to fully accept that before you put on a trade. It occurred to me that the way I think about stop losses is wrong. Before I trade, I pick a stop point, usually by technicals, and how much money I’m “willing” to lose at most. This is not truly accepting that risk!! If the trade goes bad, I feel awful that I lost, that I was wrong, that my net wins/losses keep sinking. I feel like the market faded my decision and took away my money. Of course I don’t think the market is consciously trying to get me. I attribute it more to my own “bad” judgement. This also means that if a trade goes in my favor, I’m afraid of the market reversing and taking that little bit of profit and some capital away. I cut the winner. I also will bail out at break even if a trade fades a little, then goes back to my entry point. I feel lucky to “save” the money that was at risk. I cut myself off from the possibility that the trade might work out. I basically guarantee that I will either lose 1R, scratch or win much less than my usual 1R. Add in commissions and it’s a recipie for being a net loser. Now sometimes, like in my last GSVC trade, I’ll manage the winner well. I did so because I had so much cushion from my entry point that I was no longer afraid of taking a loss. I hadn’t accepted the risk, I was just ignoring it because I had so much breathing room. If the trade had languished near my buy point, I’d probably have been looking for excuses to bail out near 16, if not for a small loss if it “looked” ominous. It hit me that to really accept the risk of a trade, I need to think of the stop loss as the ante I need to pay to find out if the trade will work or not. Instead of defining it as a “worst case scenario that probably (in my head) won’t happen”, I need to think of it like the cost to buy a lotto ticket, or the chips required to pay the blinds in poker. Your stop loss and position size should represent the amount of money you are going to pay to see if this particular trade happens in the way that your edge predicts. As soon as you put on the trade, that money is spent. It’s gone. It’s not yours anymore. You don’t need to fear losing it any more than you fear losing the dollar you pay at a carnival to throw darts at balloons trying to win a prize. If you do fear that, you are trading too large. If you had to pay $1000 to throw that dart, you’d think twice. You’d measure the cost against what you might win. As a loser trader, you just put on any old trade and then hope it works out. That’s like paying the $1000 and then hoping you hit a balloon so you get the $1000 back to pay your rent, plus whatever extra winnings you get. You are going to make poor decisions, overpay for the chance to find out if you are right, and lose in the end. I’m going to work on my personal thoughts about stop losses. I’m going to try to think of them not as a “worst case” possibility, but a certain cost. If I’m not willing to outright pay that certain cost for my potential trade, then I have no business taking that trade. A trader’s job is to judge opportunities, and unless you accurately judge the costs of testing your judgement, you’re sunk. Since I wrote the “Facing Reality and My Dilemma” post, I have received a lot of feedback. Everything from “You can be a successful trader” to “Your tools help me–don’t stop!” I was surprised and humbled by the outreach. I also received a gift of “Trading in the Zone”. This put me over the edge. I’m blown away. It placed a bid under me. I thank all of you. All this time I had hoped that my stuff would help someone to be successful. I didn’t think it would come back to me in this way. Traders consistently surprise me by the depths of their generosity and camaraderie. I’m going to make another try at trading. It will probably be another few months of preparation, but I will be back sometime in 2012. In the meantime, I will also work new tools and scripts for you readers. I had my moment of existential crisis, and now I’m back on solid footing, thanks to you. Thank you, sincerely, to all of my friends out there. Anyone familiar with my roughly 6 year long part-time trading history knows I’m a net loser. Never had a profitable year ever. Not one. I’ve ground down three small accounts now, trade by trade, loss by loss (with the occasional win, though). I’ve done the spectacular blowout before, losing 30%+ of the account at once, done the revenge trade campaign, but this time, I’ve just been wrong in my timing and direction more than I have been right. No big blowout trades, just consistently losing 1R at a time. I’ve matured to be in control of myself, I just can’t bring home the results. So as I near the close of another losing year of trading, I see that yet again it is time to stop trading. The discretionary setups I have been playing just are not working, as evidenced by my win/loss rate and my PnL. While this is a psychological blow to me, it’s not a big monetary blow. Nothing in my life changes because of the lost money. I make plenty of money as an engineer to cover our family’s lifestyle and save for retirement. Basically, the middle class dream. But there is nowhere else to go. No more upside, and very little personal freedom. That’s what trading represents to me: being in control of my own life. So far, I have not succeeded. While I have a lot of success in many areas, especially the ones that count (health, family, career), this one is where my heart is set. Either I need to give it up or try a different approach. Since I don’t have the approach right now, I’m stopping until I do. So this is not an emotional breakdown, I didn’t go tilt, no real damage done. But I am sad that I still can’t win at trading. I will likely study some more, watch the markets, maybe make another try next year. Now, the dilemma: what do I do with my programming/blogging? I feel like I have no business writing about trading, making indicators and software for other traders if I can’t even do it myself. It just doesn’t feel right. If I’m trying myself, and having success, then I feel like sharing and working is honestly good. What I worry about is this: if I’m not a good trader, then people come looking to me for something that will help them find success. I’m no snake oil salesman. I don’t want to prey on people and their desperation to find something that works. I won’t do it. So that leaves me with the question: is it ethical to do the programming work when I can’t make money myself using the same tools? Say the answer is yes. Then is it enough business to replace my income and do it full time? So far, the answer is far from yes. So where should I invest my skills to have the greatest chance at my end goal: financial freedom, while I am still “young”? Again, I don’t know. So that’s where I’m at. I believe it is possible to make money at trading, but it is far harder than even I thought. If I can’t do it, how can I help anyone else do it? And if I don’t trade or help others to, then what should I do to meet my goals? Welcome to the inside of my head. When learning to trade, there are many areas to work on. You have to find an edge. You have to have screen time to learn what different market moves look like as they unfold. You have to have a trading plan and back/forward test your ideas. You have to understand what your stocks / instruments behave like. You may paper trade in a stock market simulator. Like I describe in my WWJT post, many worry about minute details before they institute a foundation (if they ever do). Those details are important, but you need the foundation first. And one of the best ways to practice the foundational skills is through that old trader favorite: Texas Hold’Em Poker. What are the foundational skills I’m talking about? Well, as the Phantom of the Pits says, Rule #1 is cut your losses. Lose quickly and lose small. Rule #2 is press your winners. You need to have an idea of what an edge looks like. You need to recognize when the markets are likely to be bluffing and when they are serious about a move. You have to accept getting bad beats. 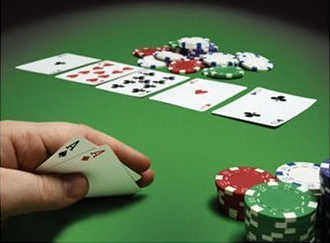 You can’t bet so big that you have to win any particular hand. If you play poker right, you are working like the house, not the gambler. Without practicing and implementing these skills, whether in trading or in poker, you are just blindly gambling–and you’re just the kind of sucker the casinos and the brokers love to see coming in the door. My biggest battle has always been psychological. And I’ve been learning a lot more by playing hands of poker than I ever did with a stock simulator! To start with, let’s talk about bet size (or for trading, position sizing). While playing my Texas Hold’em games, the first big thing I noticed is that my bet size had A LOT to do with my psychology during the hand. I had a fake $10,000 to start, and I wanted to grow it. I started at the recommended table, where you buy in with $2000 and blinds were $5/10. Typical pots were going for around $500. If you lost four times you were blown out of the game, and took a 20% drawdown on your account. As I started to play, I realized that I NEEDED TO WIN on hands where I had put a lot in to the pot. I pressed sub-par hands to “see if it would bail me out”. It was too painful to walk away from the money already “lost” on the table. Sound familiar for trading? I realized this and decided to go down to a smaller table. I bought in with $200 and blinds were $1/2. Now, I had enough of a bankroll that it didn’t matter if I walked away from a pot. I was paying $20-40 to fold instead of 10 times that amount. I was suddenly free to be picky. I could fold without pain. I could wait for my hand, where I knew I had a huge edge, and then press. I ended up doubling my money. I found the hands in general started to get a bit boring, and that’s how I knew I was doing it right. The lesson for trading? Bet small enough that you can walk away. Don’t bet so large that you CAN’T be stopped out. You have to be willing to walk from every trade you make with the loss without flinching. If not, you are sizing your positions too big. Any one trade can make you, with a huge runner. But you CANNOT allow any one trade to break you. Fold early and fold often. Make it boring. Bring enough of a bankroll to make a stop loss painless. Then you have a foundation where your psychology can work for you, not against you. Remember: you will win when the other guy makes the mistakes you used to make. He’ll press on a sub-par trade because he can’t afford to take the loss. But lose he shall.